What if a community had all the successful ingredients leading to higher rates of cycling and walking (e.g., population density, intersection density, diverse mix of land uses, bike paths galore, etc)? Would planners then being doing their job? How would this relate to the total health for residents? · Will cleaner cars, cleaner businesses, and cleaner everything else coming on-line possibly lessen the need to be concerned about pollution. · Is the fact that the study is based in Los Angeles—a basin that has perennially been out of compliance with EPA standards and probably has a disproportionate share of polluting car use (both in terms of sheer use and % of fleet that is old)—reason to suggest the issues there are not as bad as other places? It is hard to say. 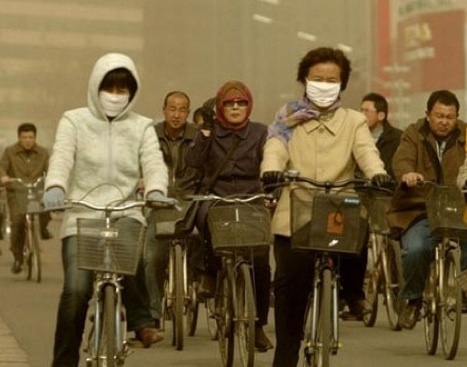 I don’t think the solution is pollution filter face masks. This work merely suggests an area worth of further investigation to ensure we are not shooting ourselves in the foot. 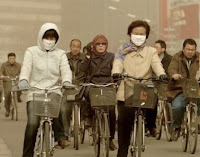 Background: Physical inactivity and exposure to air pollution are important risk factors for death and disease globally. The built environment may influence exposures to these risk factors in different ways and thus differentially affect the health of urban populations. Objective: We investigated the built environment’s association with air pollution and physical inactivity, and estimated attributable health risks. Methods: We used a regional travel survey to estimate within-urban variability in physical inactivity and home-based air pollution exposure [particulate matter with aerodynamic diameter ≤ 2.5 μm (PM2.5), nitrogen oxides (NOx), and ozone (O3)] for 30,007 individuals in southern California. We then estimated the resulting risk for ischemic heart disease (IHD) using literature-derived dose–response values. Using a cross-sectional approach, we compared estimated IHD mortality risks among neighborhoods based on “walkability” scores. Results: The proportion of physically active individuals was higher in high- versus low-walkability neighborhoods (24.9% vs. 12.5%); however, only a small proportion of the population was physically active, and between-neighborhood variability in estimated IHD mortality attributable to physical inactivity was modest (7 fewer IHD deaths/100,000/year in high- vs. low-walkability neighborhoods). Between-neighborhood differences in estimated IHD mortality from air pollution were comparable in magnitude (9 more IHD deaths/100,000/year for PM2.5 and 3 fewer IHD deaths for O3 in high- vs. low-walkability neighborhoods), suggesting that population health benefits from increased physical activity in high-walkability neighborhoods may be offset by adverse effects of air pollution exposure. Policy implications: Currently, planning efforts mainly focus on increasing physical activity through neighborhood design. Our results suggest that differences in population health impacts among neighborhoods are similar in magnitude for air pollution and physical activity. Thus, physical activity and exposure to air pollution are critical aspects of planning for cleaner, health-promoting cities. Previous Post Dedicated funding for bike/ped lost – is there still enough momemtum to overcome any loses? 1) Population health vs. individual health. Our analysis is population-level. If an individual exercises more by moving to a more 'walkable' neighborhood that shift is health beneficial even with higher exposure to air pollution. However, for a group of people moving to a high-walkability neighborhood only a fraction of those people will shift their behavior (and the shift is usually only marginal) but everyone will have higher exposure to air pollution. That finding is especially important for policy. 2) Regional variability vs. neighborhood variability. We investigated mostly regional variability (i.e., suburbs vs. city centers), however, there is likely significant variability in air pollution exposure within neighborhoods (e.g., biking on a busy arterial street vs. a local street a few blocks away). Neighborhood-level trade-offs could have implications for policies such as Complete Streets. This is a subject that is ripe for more research! I think it is an important issue and could have a meaningful impact on planning for active travel.